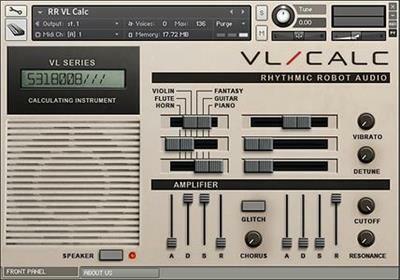 Rhythmic Robot Audio VL Calc KONTAKT | Free eBooks Download - EBOOKEE! Posted on 2018-12-27, updated at 2019-02-16, by voska89. Something that was weirdly great about the 80s was the emergence of "things that are also other things". For example: pencil erasers that also smell of candy. Or toy cars that are also toy robots. Or school calculators that are also tiny synthesisers. Casio's VL Tone series of calculators really embodied an oddball notion taken to extremes: once you've solved the square on the hypotenuse as being equal to the sum of the squares of the other two sides of the triangle, why not kick back with some funky toonz? (Luckily there was a headphone jack built in, so that the surprisingly loud two-inch speaker didn't distract the rest of the class from their studies.) Not only were there six preset sounds to fool around with, you could even - get this - program your own, by inputting laborious strings of numbers with the calculator switched to a special mode. With control over envelope, tone shape, vibrato and so on, you could come up with your own VL Tone patches, in a move which Casio presumably hoped was a kind of gateway drug to their bigger, more professional keyboards. So why shouldn't you run a mile screaming at the idea of Frankensteining a calculator and a synth into one monstrous hybrid? Well, a couple of reasons. Firstly, the VL Tone came with a dinky cream leatherette carrying-case, which wins a ton of kudos in anyone's book. Secondly, the sounds it makes are surprisingly versatile, especially once you've layered them up, made them polyphonic, and perhaps detuned things a bit. You get six preset sounds to play with: Horn, Flute, Violin, Fantasy, Guitar and Piano - and any three of these can be layered, mixed and detuned. Amplifier and Filter envelopes give you classic subtractive control, and there's a basic Vibrato control that mimics the original VL Tone style. The Glitch button fries the calculator's circuits to spark up brand new sounds with a mouse-click. Oh, and as our special nerd-gift to you, we've already typed 5318008 into the display. Basically, we've deliberately kept things nice and simple. No comments for "Rhythmic Robot Audio VL Calc KONTAKT".